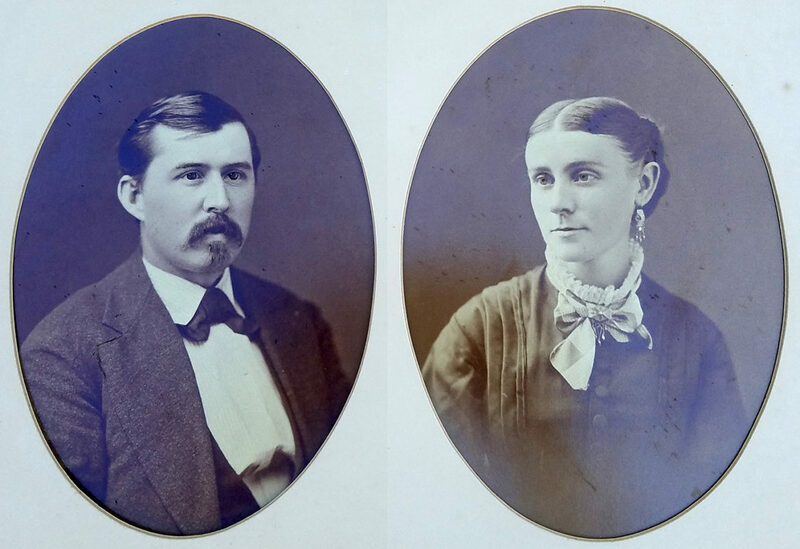 For a little over a month I have been enjoying copying and learning about the historic documents, photographs and artifacts of the William Lyman Thomas family. 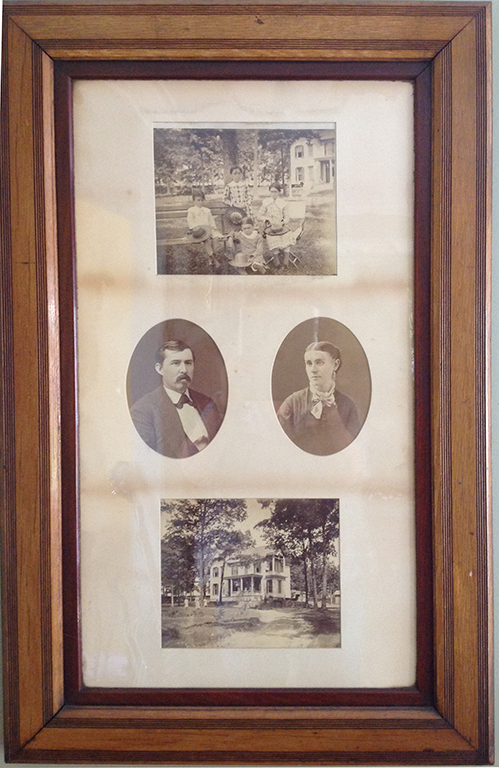 There are six framed photographs that I have been allowed to examine minutely. I have removed all of them from their frames, cleaned everything thoroughly and fixed whatever minor things I found they were wanting. The whole process has been fascinating and enlightening. 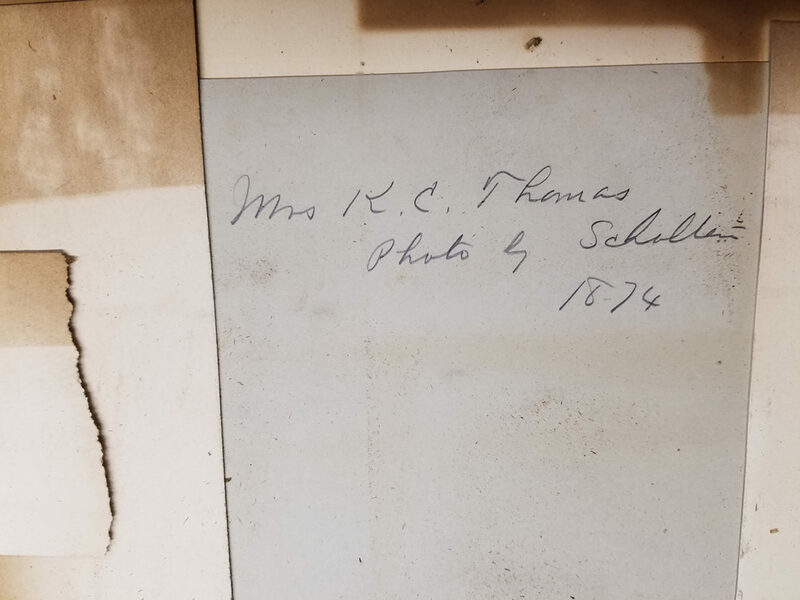 I am happy to soon be returning these items to their owner, a Thomas family descendant, some of them in an improved condition. This post is about the process I went through with the largest of the framed images. It contains four separate images that should be of great interest to present day Maplewoodites (I think I’m over using Maplewoodian). 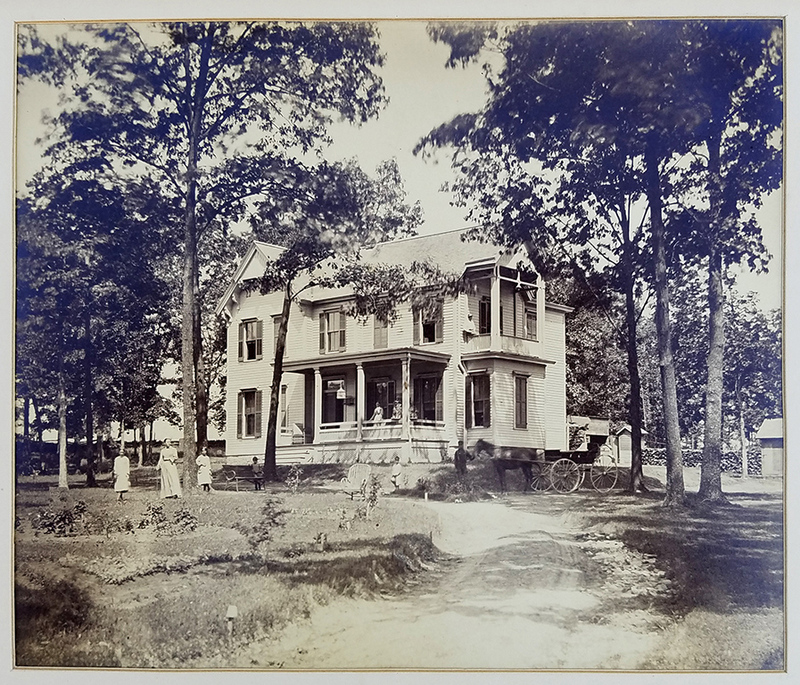 In two of the images, the Thomas family home can be seen. Named Ellendale Home Place by the family, it still exists today. Built in 1881 when there were only four residences on the Sutton farm, it may be our finest and best preserved historic home. The home is on Roseland Terrace. The front yard once sloped all the way down to Manchester. Another home and a small commercial strip have since been built there. I’ll have more to say about Ellendale Home Place in an upcoming post. This post is just about the deconstruction of the framed images and the exciting discoveries that were made. This magnificent collection of images are displayed in a frame that measures 23 1/2 by 36 3/4 inches. I can’t describe to you how privileged I feel to be able to closely examine something like this. 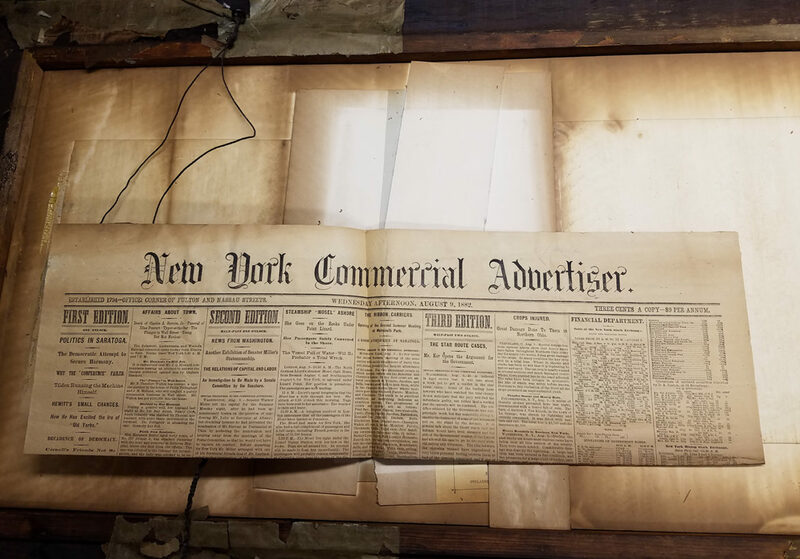 On the back I found three thin pine boards partly covered with a deteriorated shopping bag and a nearly gone newspaper. One can see at the top how a gap has opened and the topmost nails are no longer doing anything. This is due to the shrinkage of the pine boards over time. As any woodworker will tell you, wood shrinks in width and not in length. Each pine board probably shrank about 1/8 inch causing the gap to open. 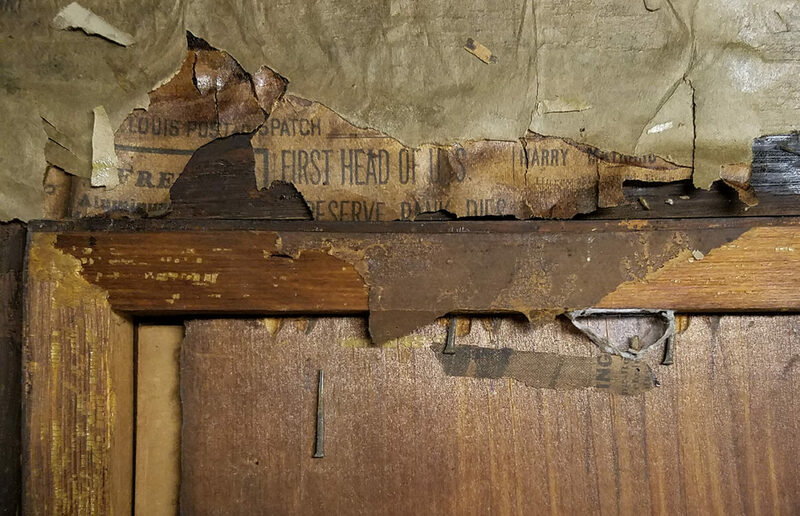 At the upper right was just a fragment of newspaper that you will find interesting. 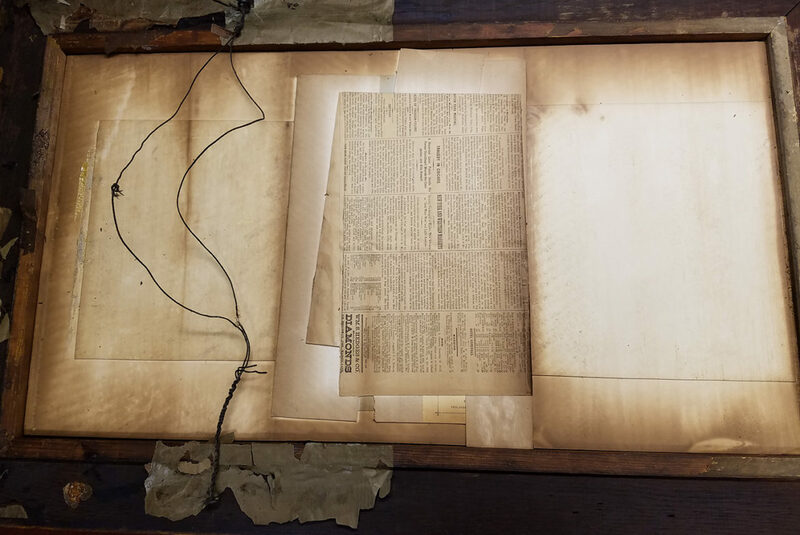 Here is a closeup of that newspaper fragment taken with the frame lying on its side. As you can see it is a piece of a newspaper from the St. Louis Post-Dispatch. There is an article titled “First Head of Reserve Bank Dies”. Also just below that headline is one of the 3/4 inch long square nails that were used to capture the pine boards. The gap at the top can also be seen on the left. 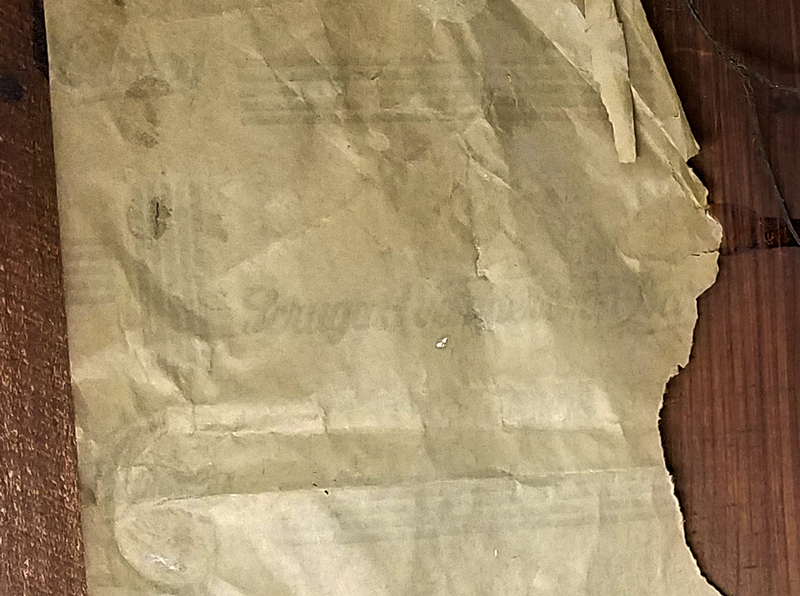 So what good is a fragment of newspaper like that? Pretty darn good if you ask me. Now we know about when some alteration happened. This was very easy to do thanks to two subscriptions I have. One to Newspapers.com and the other to Photoshop. The paper shopping bag turns out to be from a store that probably only us older ones will remember, Scruggs, Vandevoort and Barney. It was a large department store similar to Macy’s. 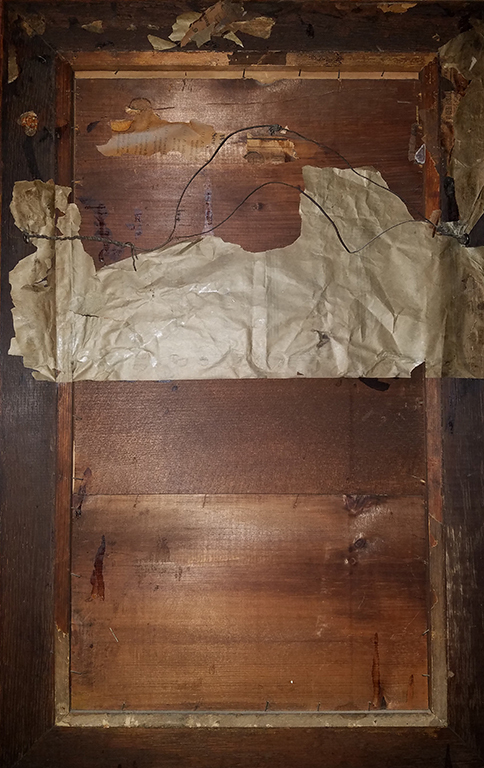 The next step was to remove the square nails that held the pine boards in place. What do you know? Another surprise! A newspaper. Believe me, this is fun. What a delight! 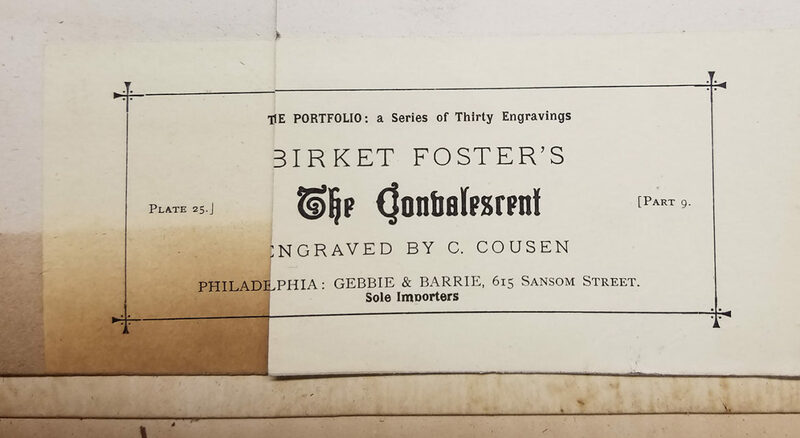 It is part of an afternoon edition of the New York Commercial Advertiser from August 9, 1882. Another date. How lucky! Seems unbelievable now that newspapers once printed more than one edition each day. This one had three! This newspaper is much wider than a current one. What you see is almost two feet, unfolded it must have been near four. So what’s underneath the newspaper? Well this was in there. It doesn’t have much meaning to us unless you know something I don’t. This was on some scraps of mat board that someone used as filler along with the newspaper. This is inscribed on the back of Kate’s photo. Another date! We really hit the jackpot. Three dates. 1930, 1882 and 1874. The KC in Mrs. K.C.Thomas no doubt stands for Kate Compton. Her given name was Catherine but she went by Kate. All of these photographs are treasures. This one of the children is great. They seem to be a little less than thrilled to have their images recorded for posterity. Ella is the oldest, then comes Emma, next Sarah and Catherine (called Kittie) is the youngest. Judging from the other photographs I’ve looked at, I think Ella may be the one in the chair, Emma is standing and I don’t know about the other two. But I’m not really sure about Emma and Ella either. In the center we have two fine images of Mom and Dad. William and Kate. 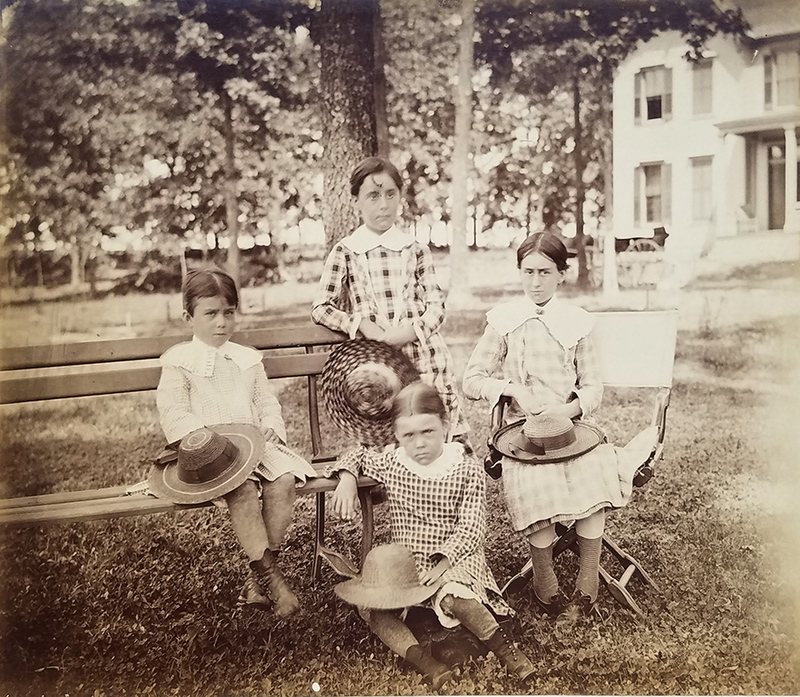 And last but not least is this superb image of Ellendale Home Place with the family in the yard. The home has been changed very little today except for the loss of the front porch and the yard around it. The side porch on the second story faces Roseland Terrace. I would like to add that Ellendale Home Place is privately owned and not open to the public. If you go by to look please be respectful. I have been inside this beautiful home a few times. The last time I took a lot of photos which I’ll include in an upcoming post. I want to thank again the descendants of the Thomas family for sharing all of these most interesting things with us. Great post, Doug! Neat work you did there with Newspapers.com and Photoshop. Thank you, Mr. Miner. 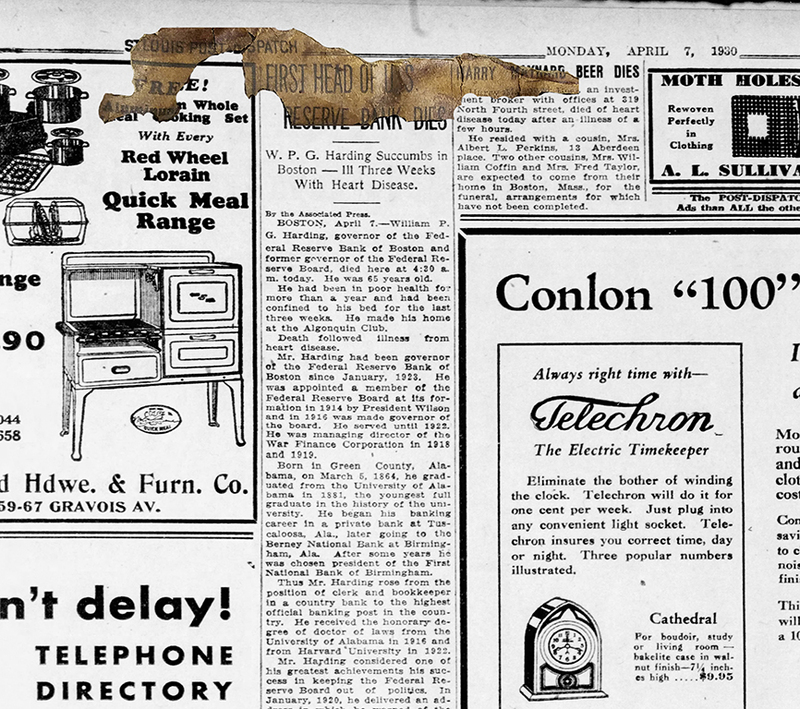 Digitized newspapers are really making a lot more information accessible than ever before.